The Student Support Services (SSS) program provides opportunities for academic development, assists students with basic college requirements, and serves to motivate students towards successful completion of their postsecondary education. The goal of SSS is to increase the college retention and graduation rates of participants and facilitate the process of transition from a level of higher education to the next. Services available to eligible students include:Career Counseling, Academic Advisement, Tutorial Services, Financial Aid Information, Personal Counseling, Transfer Information,Campus Visits to Senior Universities, Self-improvement Workshops, Diagnostic Inventories, and Cultural Awareness Activities. Fall Quarter of 1978, Enterprise State Junior College, which became Enterprise State Community College (ESCC) in January 2010, began a Student Support Services Program. The SSS program has provided over 30 years of continuous service to our students. The longevity of repeated funding from the United States Department of Education is sufficient testimony of the ongoing success of our department–which is really a measure of the success of our students. Year after year, we have the joy of watching students stretch their academic abilities and educational dreams as they discover the rewards of persistence and hard work combined with a dose of encouragement from the SSS staff. Because we are federally funded, there is a qualifying process prior to services being provided. So, if this sounds like something you could benefit from, please visit our office located in the back of the Student Center, Office Suite 111, or call 334-347-2623 ext. 2265 for more information. We look forward to hearing from you and assisting you in achieving your educational and professional goals! EduwizardS offers free online tutoring services to the students of Enterprise State Community College. Tutoring is available 24 hours a day and seven days a week. Students can take an instant session with any of the tutors available online or can schedule a session in advance with a tutor of their choice. All the features of tutoring – Free Trials, Homework Help, and Instant Tutoring etc. are available to ESCC students. FOCUS 2 combines self-assessment, career and major exploration, decision making and action planning in one comprehensive product. 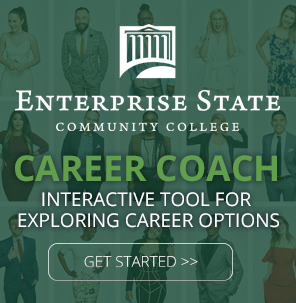 Assessment results are matched to career options and majors/programs offered at Enterprise State Community College. FOCUS 2 will guide you through a reliable career and education decision making model to help you select majors and make informed career decisions and take action.